tomato plants a few days ago. True, in the U.P. 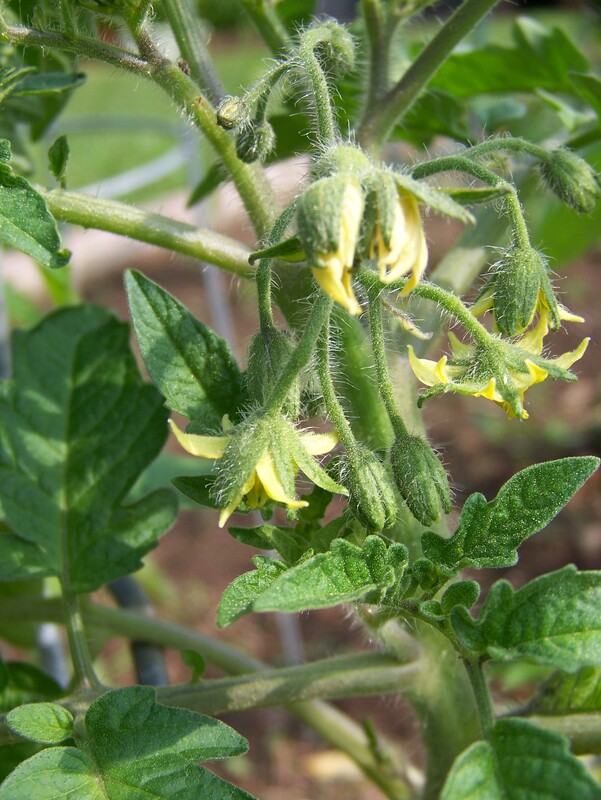 of Michigan we start our gardens late (unless you want to go through the labor of covering them each night in hopes that frost’s cruel fingers do not wrap tightly around your tender plants) but our weather can also be hot and fruitful for tomatoes. 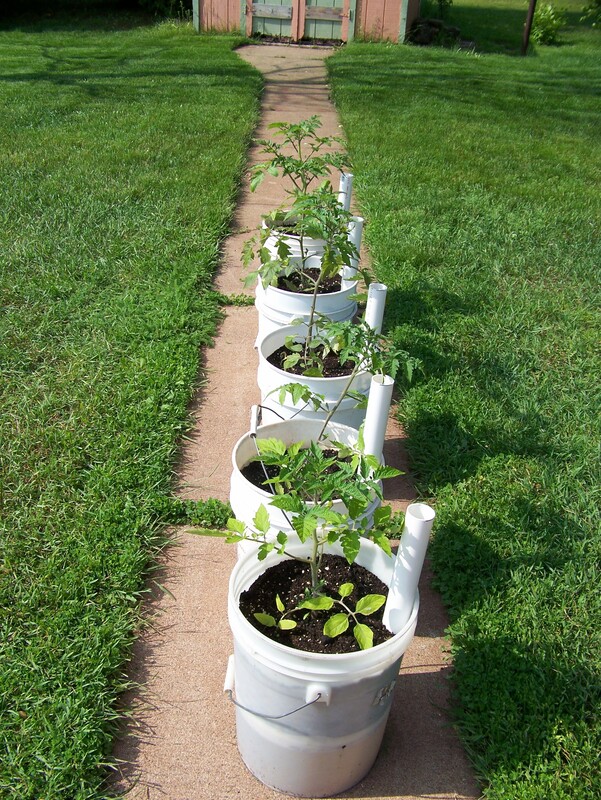 The self-watering containers that Mike built me for five tomato plants. They water from underneath. 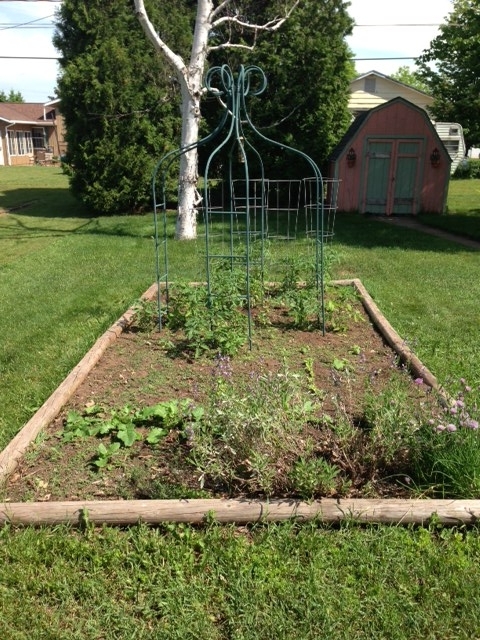 spinach, cucumber, zucchini, a couple of beans, and peas, along with a container herb garden. Turnips do especially well in my garden and I do confess that I enjoy the greens more than the root vegetable. Turnip greens make phenomenal smoothies. 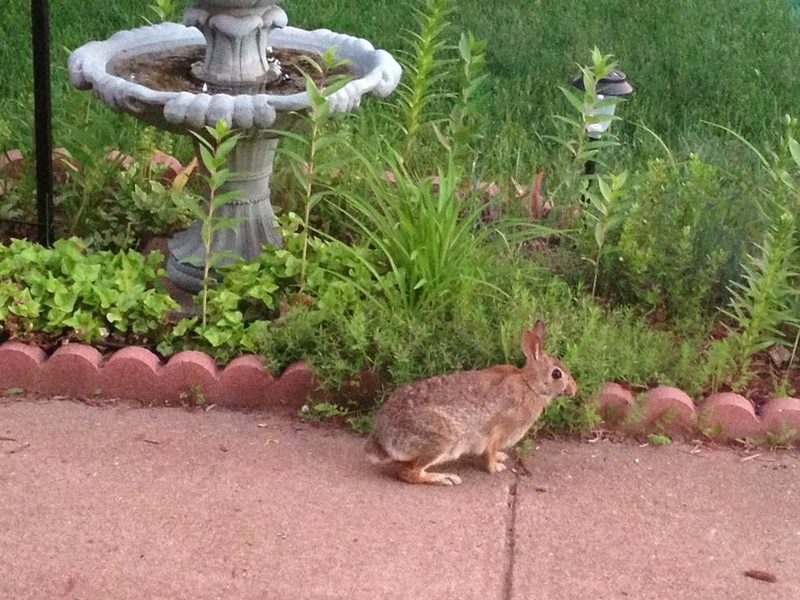 Last night I did spot a sweet little rabbit munching away on my front flower bed and a few minutes later our dog Phoebe and I caught him in the vegetable garden. (Sorry Mom, I think he nibbled on my cabbage plants…). I have a soft-spot for animals. I know that we could put up fencing, or make the liquid fence my mom swears by, but I am not too concerned since the rabbits seem to leave my tomatoes alone. Soon our farmer’s market will be brimming with fresh produce and I am looking forward to being able to support local farmers. With an abundance of fresh produce, summer is salad season. While we eat salads year round, in the summer our salads often take center stage and become the main course. When it is hot a salad really hits the spot and is a snap to prepare (without having to cook). I love to make my own salad dressings so I know exactly what I’m eating. I feel better knowing that my dressing is preservative and additive-free, and since I control how much oil I put in, my dressing is easy on the waistline. I normally do not follow a recipe and just dump in the ingredients, but I have come to realize that being a food blogger means that I have to share exact measurements. 😉 Though, as I always mention in my posts, make sure you tweak recipes to suit your own taste buds. When it comes to salad dressing I prefer tart and tangy. The only salad dressing that I buy is Newman’s Own Light Italian and an occasional bottle of Annie’s. I keep two bottles in the refrigerator and when I buy a fresh bottle, half gets dumped into the other and I fill both with a combination of vinegar and lemon juice. Not only does this give me the tangy taste that I desire, but cutting it with vinegar/lemon juice, also makes it less fattening. 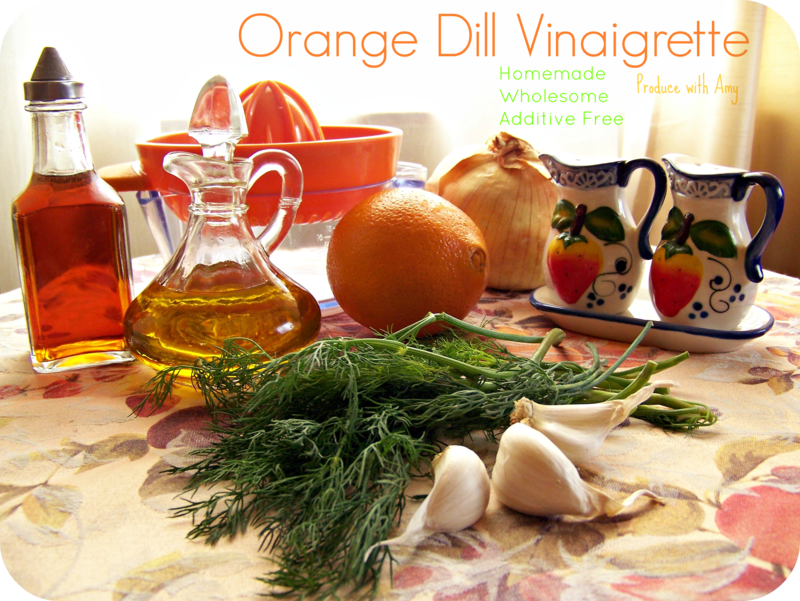 Today I am going to share my recipe for Orange Dill Vinaigrette. 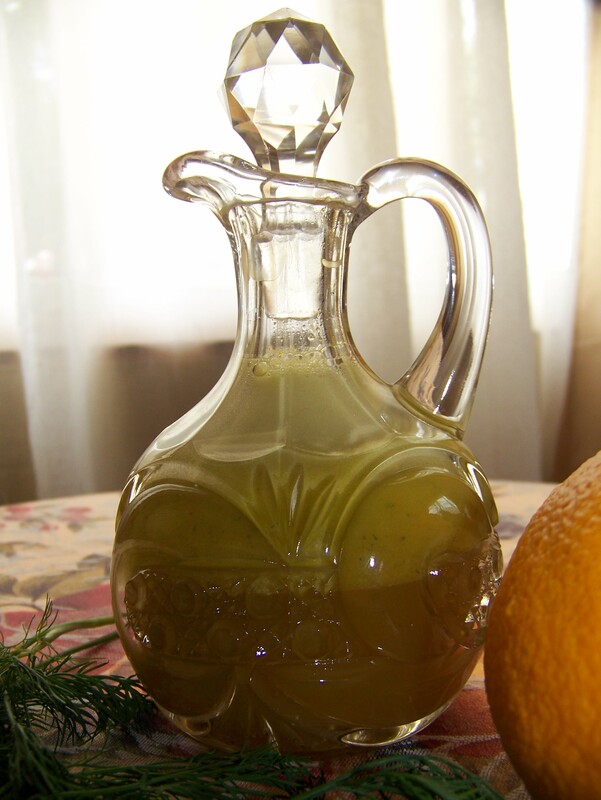 Because of the addition of orange juice it is a sweeter variety of dressing and you can control the level of tartness by how much vinegar you add. Often when I make dressings I do not add the oil in and instead add the oil to each individual salad for portion control. Often people trying to manage their weight want to skimp on the oil, but a high quality olive oil truly enhances the taste of dressing and has so many health benefits. The oil helps us absorb the Vitamin K in the greens, keeps our digestion regular, is necessary for proper brain function, and our skin, nails, and hair really benefit from the nutrients in the oil. For this recipe I keep the oil portion small but adding more would work as well. 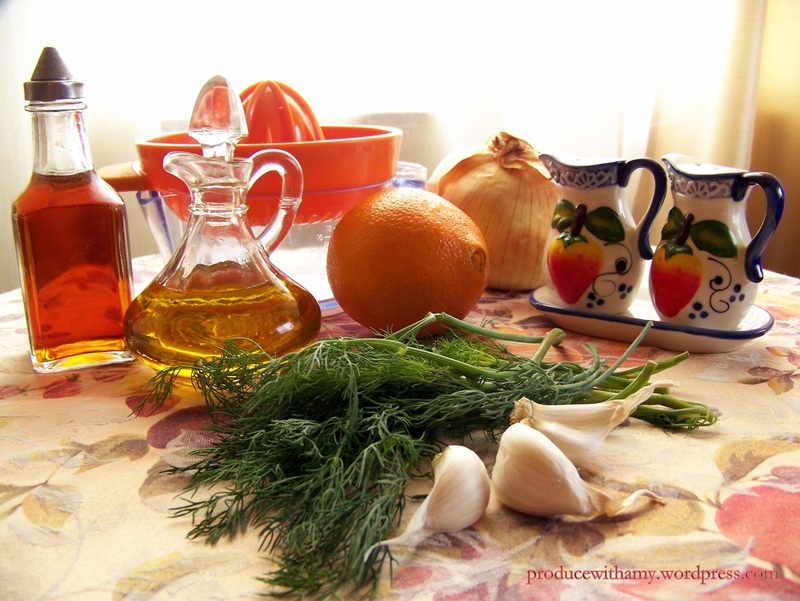 After investigating vinaigrettes on-line I found that some chefs use a 3:1 oil to vinegar ratio for dressings. To make the dressing you can chop the onion, dill, finely mince the garlic and whisk all of the ingredients together. 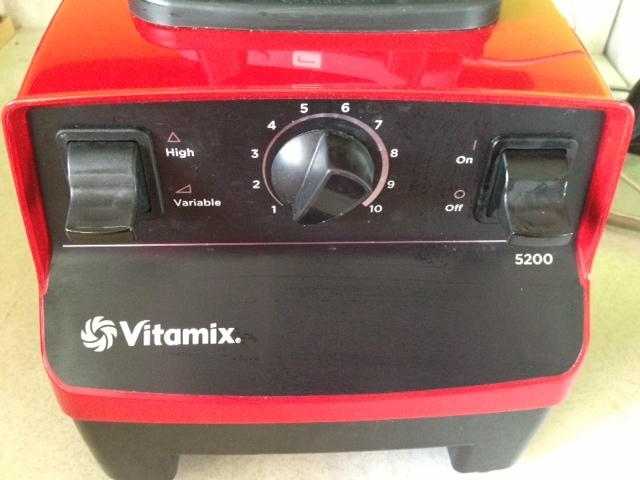 However, the best method that I have found is to put all the ingredients into the blender and give it a good pulse. If you want to make the dressing more visually pleasing you can add some chopped dill to the final product. Store in the refrigerator in a cruet or Mason jar (or recycle a jar the next time you have one) and give it a good shake before serving. People often ask how long my salad dressing last in the refrigerator but I end up using them within a week . I would imagine that this one would last for a couple of weeks. 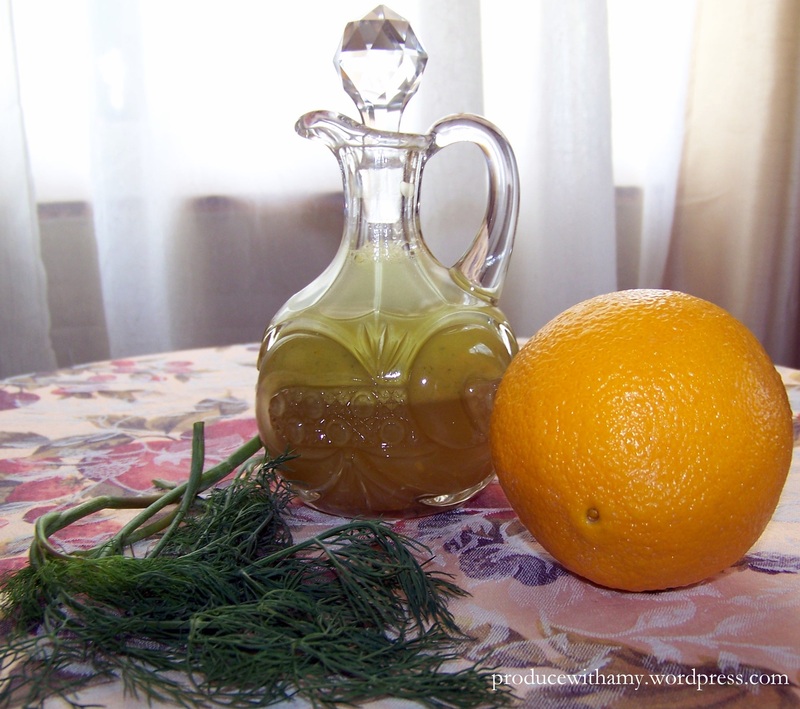 This dill in this dressing marries well with the orange juice and it gives it just the right balance of tangy and sweet without having to add sugar. 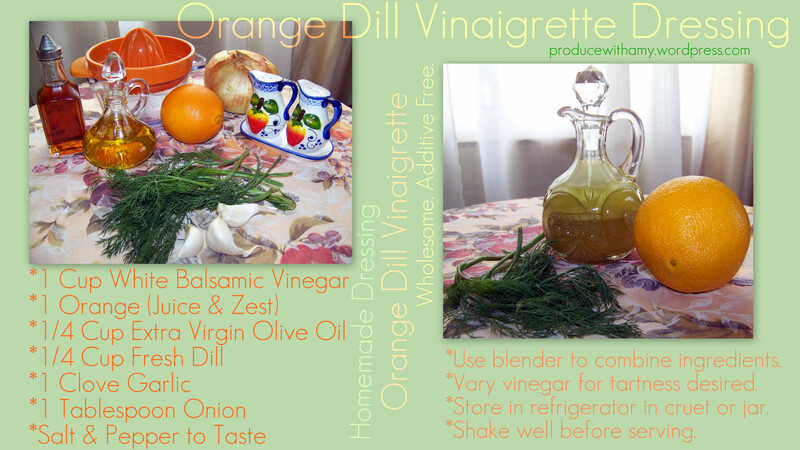 In my next post I will be featuring a salad that I came up with using my Orange Dill Vinaigrette Dressing. To give you a hint it combined roasted beets, mango, blueberries, and other fresh vegetables for a vibrant and cool summer salad. It is a perfect plated dinner salad or can be layered in a Mason jar. My latest goal is to not buy bottled dressing at all, so I promise to keep the salad dressing recipes coming! If you are interested in more homemade dressings here are my recipes for Tangy Ranch and Zesty Avocado (plant-based dressings). Link to Ranch and Avocado dressing recipes on Pinterest. I hope you enjoy the Orange Dill Vinaigrette dressing as much as I do. Please join the conversation by “liking” my Produce with Amy facebook group. Recipe reviews are always appreciated and let me know what kind of recipes interest you. I love being able to help others maximize their health and productivity by eating more fresh fruit and vegetables. Cheers to additive and preservative free salad dressing, the bounty of summer, and thriving! (Clink on image for a larger version). This entry was posted in Uncategorized and tagged Dill Dressing, Homemade Salad Dressing, Olive Oil, Orange Dill Vinaigrette, Plant-Based Salad Dressing, Vegan salad dressing, Vinaigrette, Vitamix by Amy. Bookmark the permalink.